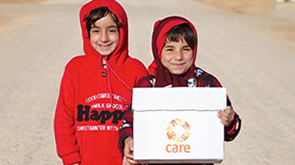 CARE has been providing development and humanitarian assistance in Uganda since 1969, responding to armed conflict, natural disasters and economic and social marginalisation, mainly in rural areas. Our programmes target vulnerable communities – the extreme poor, internally displaced people, women, children and disabled people. Our economic rights projects help vulnerable people earn a better living. We help families find ways to cope with deforestation, soil erosion and environmental degradation. Our work in refugee camps brings together people from different groups to resolve their conflicts. More than 800,000 people have fled from conflict and hunger in South Sudan and are now living as refugees in settlements and camps in Uganda. CARE is providing assistance to South Sudanese refugees in Rhino camp, where we are providing maternal health, water and sanitation, gender-based violence, and livelihoods support; and in Imvepi settlement, where we are providing gender-based violence and protection support, sexual reproductive and maternal health services, and shelter support including for people with special needs.